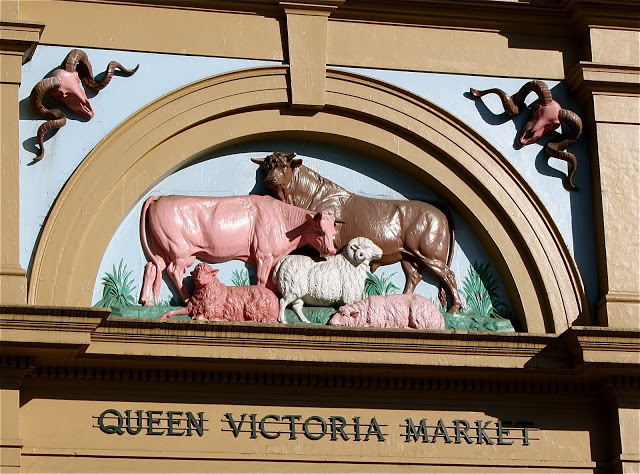 “Where ya from?” asked the squinty-eyed man at a jewelry display deep in the Queen Victoria Market. “The USA,” I said. “Minnesota,” I added, as I poked around his glass case of silver earrings. This I did not know. I was now of course compelled to tell him that I’d actually flown in from Berlin. It’s a marvel to walk the crowded, steamy streets of Melbourne and encounter this charming Aussie talk. Though the catchphrases are nothing that would ever roll off my tongue, it is a wonder to have flown 22 hours and still understand the language. One of my first impressions of Berlin was that it reminded me of Melbourne, but now that I’m in Melbourne for a second time, I see that they bear only superficial similarities. Beyond their high-functioning transit systems, they share a flourishing café culture. Walking along a busy sidewalk in Melbourne or Berlin, you pass strings of packed cafés with outdoor seating, as well as a profusion of ethnic offerings. Coffee shops and wine bars abound in both places, but where Berlin has oodles of Turkish falafel and döner places, Melbourne is overrun with sushi and dumplings and meat pies. Delicious sushi and dumplings and meat pies, I might add. The two-story structures of my sister’s neighborhood strike me as surprisingly squat after being in six-story Berlin all these months. Melbourne has the more classic city form, with single-family housing nestling together, giving way to high-rise apartment buildings, and finally erupting into a full-blown downtown with block after block of skyscrapers. 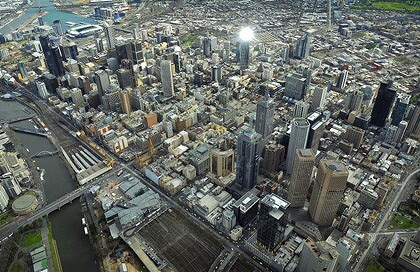 And Melbourne, most helpfully, is built on a grid that is easy to grasp. The streets all shift at an angle to match the curve in the river, but in a way that is much like Minneapolis. It feels familiar. Berlin, of course, does not hold to a grid, and streets have a habit of veering off in surprising directions and changing names with alarming frequency. Melbourne’s major streets also change names, but they all shift along one avenue, Victoria Street, so they’re not hard to keep straight. I’ve walked in and through the city three times now and haven’t gotten lost once. This is a layout I understand. Flying out of Berlin I had the chance to catch an aerial glimpse of the city and was struck by the uniformity of the building heights. It was a great vantage point from which to appreciate how most of the buildings have cut-out courtyards and fit together one against the next for miles in all directions. 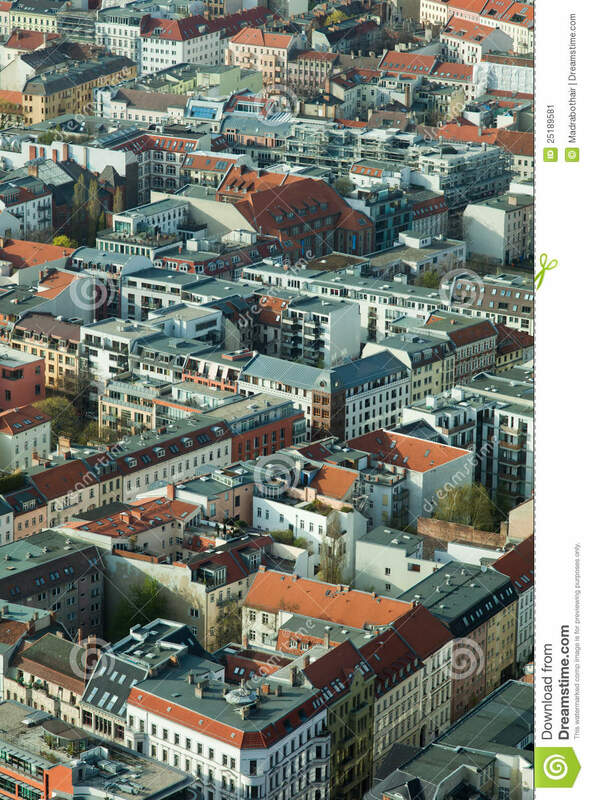 Only the dense block or so of Potsdamer Platz resembles a typical downtown; the handful of tall buildings quickly returns to the six-story theme that characterized the city long before the war and persists to this day. I’m aware of Berlin’s look and feel receding from me as I embrace the vibrant summer of Melbourne. The beating sun, the stream of breezy sundresses and sandals, the startling sight of palm trees—all this lushness pushes the dirty-snow streets of Berlin to the edges of my mind. I feel that pleasant vacation ease settling in. I could have sat on the banks of the Yarra River with my iced coffee all afternoon. Yet I’ll be back in Berlin with my family soon enough, and that’s a welcome thought. This entry was posted in City life, Travel - Beyond Berlin and tagged Berlin, cafés, city plans, döner, falafel, grid, Melbourne, summer, sushi, Yarra River on February 2, 2014 by Jill M..
Hey. We were curious: did you fly over Asia or the Pacific? [Asia, I’m guessing]. How long was the flight? Great post! Thanks, Chris! I went via Asia — I had a layover in Bangkok. First I had to get to Frankfurt, then 10 hours to Bangkok; 10 hours to Melbourne. Long trip! Berlin in its greyness misses you. I’ll admit Berlin had some decent sun over Thanksgiving and Christmas, but the Australian sun is on a whole different scale of brightness. Thanks, Hanna!